Ramiro Espinoza’s affinity for Baroque types and his desire to study their characteristics in detail were the driving forces behind this new type family. As is typical of his revivals, Reiher Headline does not faithfully follow the forms of historical sources. Espinoza made numerous updates and modifications to the design so that it would better suit the tastes and requirements of contemporary type users. 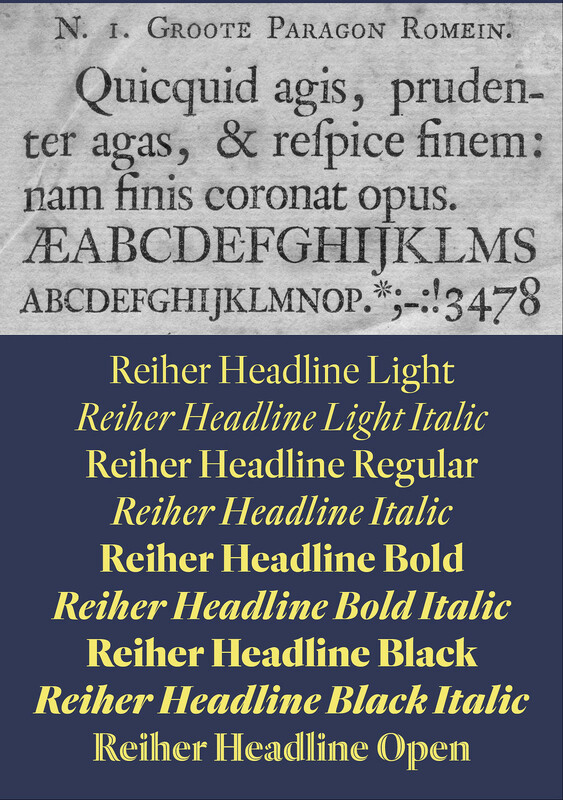 The Reiher Headline romans were based on the handsome N° 1 Groote Paragon Romein, a rather condensed typeface whose punchcutter has not yet been identified. These types are almost certainly of German origin, having appeared in such seventeenth-century books as Scrutinium chimicum vitrioli [Jena, 1666] and in the 1671 specimen produced by the Anton Janson foundry in Leipzig. Speculation about the origins of this typeface appears in texts by notable typography historians like Axel-Nilsson, A.F. Johnson, G. Haiman, and J.A. Lane. Reiher Headline’s italics were based on the Aszendonica attributed to Nicholas Kis that can be found in the Ploos van Amstel specimen, as well as in numerous books and catalogues printed in the Netherlands in the seventeenth century. Several of the ornaments included in the Reiher types have been ascribed to Jacques-François Rosart, and were used extensively throughout Europe and the Americas during the seventeenth and eighteenth centuries. 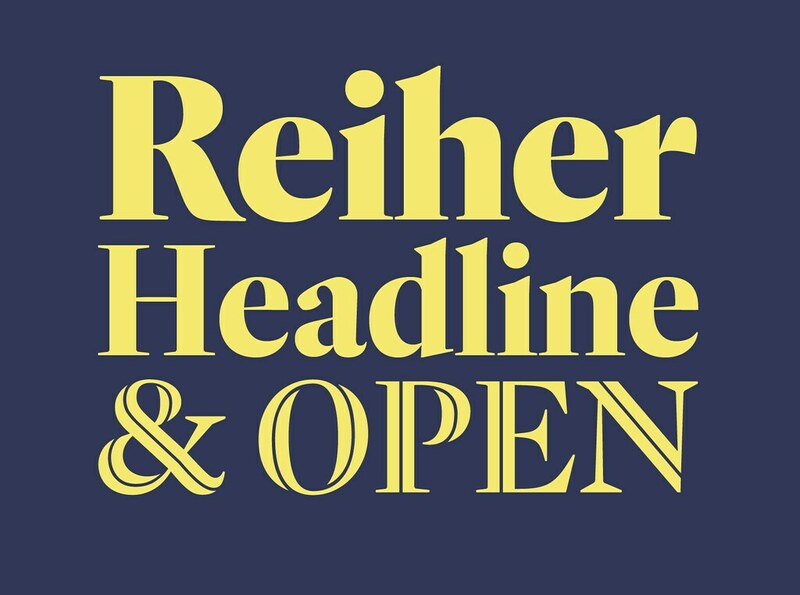 Espinoza further expanded the possibilities of his new family with Reiher Headline Open, a decorative inline version of Reiher Headline Bold. Reiher Headline was designed with magazine and newspapers in mind. These typefaces display a marked contrast and a crisp presence both in print and on screen, making the family an ideal choice for robust titles, pull quotes, and introductory texts. The Reiher Headline suite of feature-rich OpenType fonts is fully equipped to tackle complex, professional typography. Its extensive character set includes small caps, fractions, alternate characters, case-sensitive forms, five sets of numerals, and plentiful ornaments and fleurons. In addition to standard Latin, Reiher Headline supports Central European, Baltic, and Turkish languages. You can download the PDF specimen or purchase the font family.